Part of our roles as curators is to acquire, or purchase, taonga Māori (Māori treasures) to further strengthen and develop Te Papa’s collection. When considering taonga tūturu (customary taonga) for acquisition, it’s the interesting, the novel, and the extraordinary that we tend to focus on these days – not surprising given that we have been collecting since 1865 and have in excess of 30,000 taonga in the Mātauranga Māori (taonga Māori) collection. With over 100 mere pounamu (greenstone weapons), we have more than enough to adequately represent the form. However, in recent months we purchased two mere pounamu to complement our collections, Whakaae-whenua and Tinirau. Whakaae-whenua belonged to the Puketapu chief Rāwiri Waiaua. It has become symbolic of the events that defined Māori–colonial relations in the 19th century. Today it remains a witness to the important historical events that became known as the Puketapu Feud. In 1854, Waiaua was one of the principal rangatira (chiefs) involved in the sale of the Te Hua land block, part of the greater Bell Block in Taranaki, to the colonial government. The sale occurred at the same time that a group of Taranaki iwi (tribes), later referred to as the ‘Māori Land League’, proclaimed their determination to cease all Māori land sales between Ōkurukuru (near New Plymouth) and Kai-iwi in southern Taranaki. 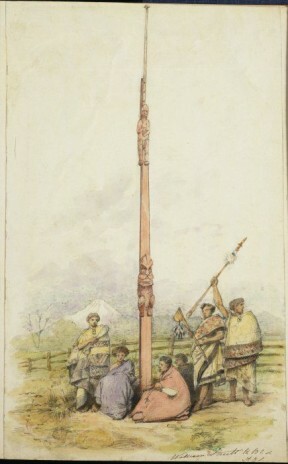 This pole was erected by Kātātore on the disputed Te Hua block as a boundary marker and to warn against European encroachment. 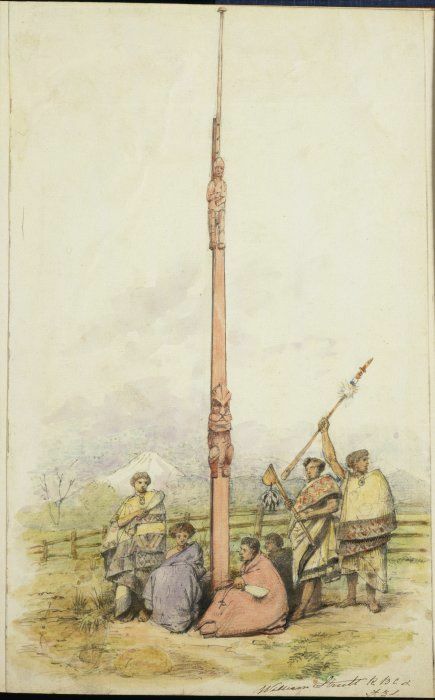 It was called Te Poutūtaki by Puketapu, and Fitzroy’s Pole by Europeans. Made of pūriri wood, it stood approximately 9 metres in height and featured the carved effigy of the Puketapu leader Parata Te Huia looking down upon the cowering Europeans. Waiaua’s cousin, Te Waitere Kātātore, was among those who had campaigned for the retention of Māori land for some years. He warned Waiaua not to proceed with the sale of the Hua block. The colonial government considered this a hostile obstacle to the pastoralisation of the rich Taranaki lands by Pākehā (European) immigrants, and the continued economic growth of the colony. 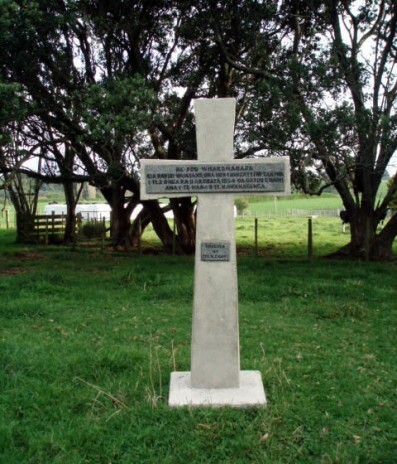 The events that followed were witnessed by a neighbouring Pākehā farmer, William Hulke. Hulke farmed part of the Bell Block and was a neighbour and friend to Waiaua. On the morning of 3 August 1854, Waiaua went to visit Hulke, expressing his concern that his dispute with Kātātore may escalate. He had been on his way to cut the boundaries for the block when he had seen someone suspiciously loading a rifle. Waiaua wished to say his farewells in case things should take a turn for the worse. Later that morning, Hulke heard rapid gunfire. Riding out to Waiaua’s property, he encountered a terrible scene. The bodies of 4 of Waiaua’s men lay dead across the track, while 12 other men lay scattered and wounded. Waiaua was among them, mortally wounded with a gunshot to his side. Hulke attended to Waiaua, who drew him near and whispered that he had secreted his mere pounamu, ‘a tribal one of great beauty and value to the Māori eye’, between his legs. He told Hulke to take it away and ‘conceal it in a place of absolute security’. Hulke took Whakaae-whenua and returned home. His wife hid the mere in their feather mattress, which she quickly restitched. Kātātore and his men later appeared at the Hulkes’ house, accusing them of possessing the mere and demanding that they hand it over. Kātātore’s men searched the house thoroughly, but failed to find the precious mere! Of the original 26 members of Waiaua’s party, 16 had been shot. Of those men, 6 died, including Waiaua’s brother, Pāora. Rāwiri Waiaua died 3 days later, on 6 August 1854. 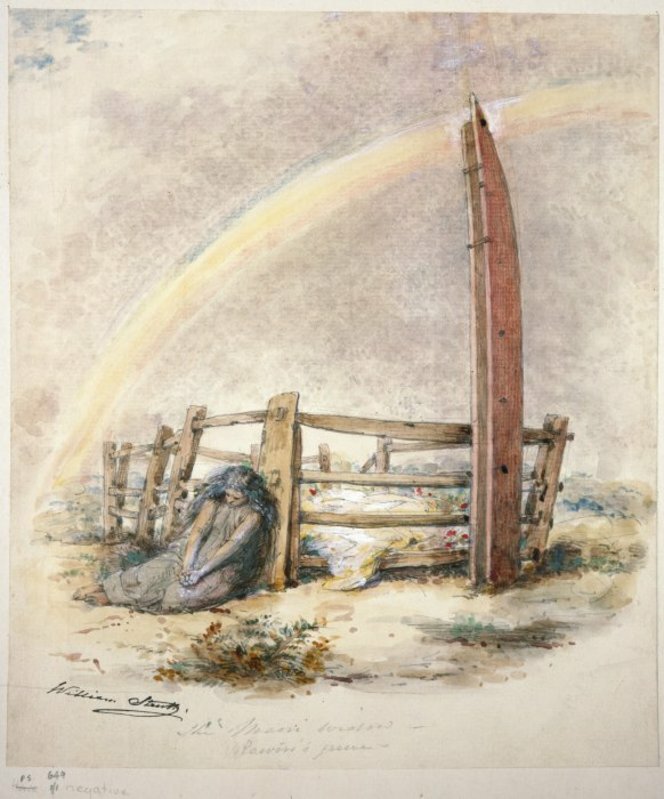 William Strutt, ‘The Maori Widow – Rawiri’s Grave’, 1855. E-453-f-002-1. Several years later, the Puketapu tribe met with Sir Donald McLean, then Chief Protector of the Natives. 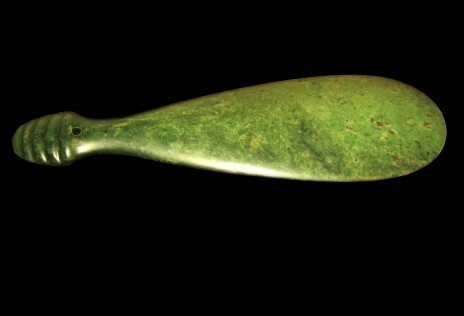 At this meeting, William Hulke presented the mere pounamu to McLean and explained how it had come into his possession. Hulke told McLean that he hoped the mere might now be passed on to Waiaua’s young son. McLean addressed the Puketapu people and related how the mere had been entrusted into Hulke’s care. Waiaua’s young son was called forth, and Whakaae-whenua was placed into his custody. Two other murders, the killing of Rīmene of Ngāti Ruanui and, later in 1858, that of Kātātore (ambushed in retaliation for Waiaua’s death), triggered a series of violent retaliatory intertribal feuds. These feuds eventually collided with the ongoing political tensions around Māori land and resulted in the violent conflagration that was the Taranaki land wars. Whakaae-whenua was later presented to District Land Purchase Commissioner Robert Parris by two elder relatives of Rāwiri Waiaua, Karepa and Haena. They said it had been promised to Īhāia Te Kirikūmara as payment for the killing of Kātātore. Karepa and Haena now feared that handing over Whakaae-whenua to Īhāia might escalate hostilities. Parris agreed to accept the mere on the condition that he could consult Īhāia and seek his approval. Īhāia consented on the understanding that Whakaae-whenua would remain with Parris. Parris retained the mere for the remainder of his life. Whakaae-whenua remained among Parris’s descendants for the following four generations. It was acquired by Te Papa Tongarewa in 2010. In actual fact, they were asserting their own mana and independent authority, rather than that of the British Crown. Please do you know the story of Tinirau Tahwaki? Is a Maori sail to ellice island?